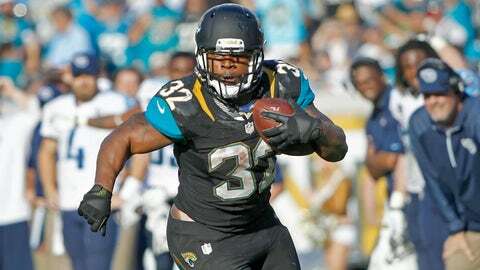 Maurice Jones-Drew has run for 8,071 yards and 68 touchdowns in eight seasons with the Jacksonville Jaguars. JACKSONVILLE, Fla. (AP) — The Jacksonville Jaguars plan to let veteran running back Maurice Jones-Drew test free agency. General manager Dave Caldwell said Tuesday that Jones-Drew has "earned the right" to enter the market in March. Caldwell added that the Jaguars would decide whether to match or beat another team’s offer. "This is his first time, he’s been a great player in this organization, he’s had a great career and he’s earned the right to see what his value and his market is," Caldwell said. "And it’s our right to decide if we want to match it and bring him back. I think that’s kind of where we’re at now." Jones-Drew, a second-round draft pick in 2006, has 8,071 yards rushing and 68 touchdowns in eight seasons. He missed the final 10 games last season with a left foot injury and played much of this season while recovering from surgery and dealing with a strained right hamstring. The running back made it clear Monday that he wants to stay in Jacksonville, but said his decision is all about money. He just played out a five-year, $31 million contract. The deal paid him $4.95 million in 2013. Jones-Drew also acknowledged Monday that he has a number in mind, but he sounded resigned to a potential move. "Hopefully I can stay here, but that’s not up to me," he said. "It’s time to sit back with my family and talk and see what’s best for us. I have three kids, don’t want to move them around, but if that’s the case, then it has to be done. We’ll see. There are some other variables." Last year, the free-agent market for running backs was relatively soft. Detroit’s Reggie Bush (4 years, $16 million), Atlanta’s Steven Jackson (3 years, $12 million), Buffalo’s Fred Jackson (3 years, $10.8 million) and Tennessee’s Shonn Green (3 years, $10 million) failed to land huge deals in the open market. Jones-Drew certainly will want at least something similar, if not better. Then again, he’s coming off one of his worst seasons. He ran for 803 yards and five touchdowns in 2013. Critics argue that Jones-Drew, who turns 29 in March, has lost a step and hasn’t been the same since gaining 1,606 yards on 343 carries in 2011. They also insist his running style — he welcomes contact and gains most of his yards between the tackles — will shorten his career. Others, including Jones-Drew, believe he will return to Pro Bowl form once he fully recovers from his foot injury. They also point to this being his first season running behind a zone-blocking scheme and that he lost both starting offensive tackles early in the year. Caldwell, though, sounded like the team is ready to move in another direction. "I think we need to upgrade," Caldwell said. "We’re always looking to upgrade all positions. Step 2 is to raise that standard of acceptance, and we do have to address that. We always have to have a contingency plan in place for all positions."